Waianae's Justin Kauwalu plowed through Kealakehe defenders. If defense truly wins titles, the Waianae Seariders looked ready to take on the part of champion last night. Waianae's defense limited Kealakehe to 244 total yards in a convincing 28-14 win last night at Raymond Torii Field. A capacity crowd saw Oahu Interscholastic Association runner-up Waianae (8-4) advance to the semifinals of the First Hawaiian Bank/HHSAA State Football Division I Championships. Third-ranked Waianae will face Saint Louis, the Interscholastic League of Honolulu champion, on Friday at Aloha Stadium. "I'm relieved. They gave us things we didn't expect," Waianae coach Daniel Matsumoto said. "This game is over. Now we've gotta focus on the next one." Preston Ayala sparked Waianae's defense with three interceptions, while linebacker George Kauwalu finished with a team-high 10 tackles. Kealakehe standout Gabe Tuata, who recently gave UH his oral commitment, finished with 33 yards rushing on nine carries and six receptions for 49 yards. Big Island champion and eighth-ranked Kealakehe, which scored 580 points while winning its first 12 games, finished the season 12-1. After watching four Kealakehe games on tape, Waianae defensive coordinator Jason Hussey had his defense prepared for the shifty senior. "We figured they would run the option. They were cracking back with the tight end, 65 (Levi Legay), lined up on the other side," Hussey said. Kealakehe had some early success with quick option pitches to Tuata out of the I formation. But that didn't last long. Once Waianae's defense adjusted, Kealakehe took to the air. "We had trouble with the ends," Walters said. "Their defensive end gave us trouble, and we started having success throwing the ball, so we stuck with that." 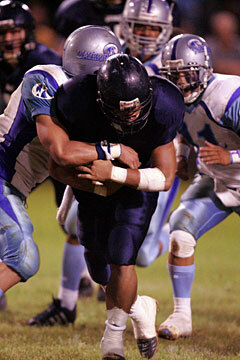 Waianae was ready for Kealakehe's mix of shotgun sets. "Kealakehe is well coached, but in the Red West, we see that combination. Quad, empty sets, trips. We see that on a regular basis," Hussey said. "Tuata is a great back, but we see a lot of great backs. We try not to segment any individual player. We did structure some coverages to take account of him." Tuata saw more than that. Waianae's Tyson Ranada tried to slip by Kealakehe's Cash Germano in the first half last night. "They shifted to me a lot. They even knew my name," he said, noting the pursuit of Kauwalu. Tuata called him the best linebacker he's seen this season. "He's real good. He's gonna go somewhere. He's everywhere," Tuata said. "We shot ourselves in the foot in the first half," Kealakehe coach Cliff Walters said of the early turnovers. "We haven't had that problem all year. I think it was a matter of our guys being nervous a little bit. We got down, (Waianae) got up, and you can't do that at someone's house. Waianae's an awesome team. I hope they do well in the rest of states like I think they can. We just don't see that kind of competition until the end of the year." Kealakehe's first two turnovers came on its first four plays from scrimmage. Fetuani Iongi, at fullback, had trouble on a handoff exchange with quarterback Keoki Limahai on the second play from scrimmage, and Waianae's Chad Dulan recovered at the Kealakehe 29-yard line. Waianae's first series ended four plays later, however, when Kealakehe linebacker Tinirau Lowry stopped running back Joe Abell on fourth and 1. The Waveriders gave the ball right back two plays later when Iongi was stripped in the Waianae secondary and Isaiah Tua recovered the football at the Kealakehe 29-yard line. Moments later, Ben McQuown executed a play-action pass to Justin Kauwalu, who beat defenders down the sideline and scooted past a final Waverider at the 5-yard line for a 24-yard touchdown play. Waianae led 7-0 with 8:28 remaining in the first half. The Waveriders went to reserve quarterback Jordan Ursua midway through the first half, but he fumbled on a sack by David Paaluhi. Noah Halemano returned the fumble from the Kealakehe 46-yard line to the Kealakehe 23, where he fumbled the ball right back. Kealakehe's Iongi recovered to prevent another potential score for Waianae. The Seariders drove 63 yards in just five plays for their next touchdown. They called a time out on third and 16 and came back to the field with a 24-yard touchdown pass from McQuown to Charles Humble on a deep corner route. The PAT kick was wide right, but Waianae led 13-0 with 5:35 to go in the first half. A couple of pass-interference calls against Waianae helped the Waveriders march 65 yards to their first score. A shovel pass to Iongi turned into a 14-yard touchdown play on the near side as Kealakehe pulled within 13-7 with 2:23 remaining in the first half. Waianae's mammoth offensive line pounded away in the third quarter and seized control of momentum with a 14-play, 89-yard march. All but one play was on the ground, and the Seariders finished it off with an 8-yard run by Joe Abell. The senior running back followed 6-foot-2, 270-pound Alex Tupulua around right end to score easily. After McQuown connected with Don Medeiros on a 2-point conversion, Waianae led 21-7 with 1:40 left in the third quarter. The scoring drive took 7 minutes and 40 seconds off the clock. "They killed the clock, cooled us off on offense and it was an uphill battle after that," Walters said. Wain--Justin Kauwalu 24 pass from Ben McQuown (Willie Duseigneur kick). Wain--Charles Humble 24 pass from McQuown (kick failed). Kea--Fetu Iongi 14 pass from Keoki Limahai (Lanakila Ynigues kick). Wain--Joe Abell 8 run (Don Medeiros pass from McQuown). Wain--Cranston Newman 22 pass from McQuown (Duseigneur kick). Kea--Limahai 16 pass from Jordan Ursua (Ynigues kick). RUSHING--Kealakehe: Gabe Tuata 9-33, Iongi 5-15, Limahai 6-11, Max Papalii 1-0, Ursua 4-(-4). Waianae: J. Kauwalu 11-74, Abell 11-39, David Ferreira 4-26, Roy Demello 4-24, Danny Kekoanui 4-13, Storm Akiona 1-0, McQuown 2-(-11). PASSING--Kealakehe: Limahai 11-21-3-143, Ursua 6-9-0-46. Waianae: McQuown 10-15-1-167. RECEIVING--Kealakehe: Tuata 6-49, Ursua 4-46, Iongi 2-27, Thomas Keliinohomoku 2-26, Devan Kepa Kamoku 2-25, Limahai 1-16. Waianae: J. Kauwalu 2-45, Newman 2-34, Medeiros 1-28, Humble 1-24, Miller Ualesi 1-19, Kekoanui 1-12, Tyson Ranada 1-4, Abell 1-1.